Bien des nouvelles. Ca vaut plus que la paine d’acheter des toons mentionée la d’sus. 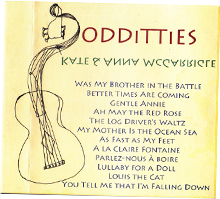 Would love to be able to hear Odditties but not everyone’s got access to itunes! Can you make a download CD buyable for those of us who want mp3s we can burn to CD on Windows Media Player? It has been so quiet during your summer…up dates keep us positive that the music of your clan is never ending! Just wanted to share this….my daughter is a huge Kylie fan and we have shared her concert extravaganza a couple of times in Sydney! Imagine how incredibly excited she was to be the first to tell me that Kylie and Rufus were to be performing on the same stage and then imagine the pressure she put me under to somehow get us over there to be a part of it all! Well, we didn’t make it over but we have watched many clips and it looks like it was the best day! lot’s of joy and love and of course great music. I’m pleased that my daughter now loves Rufus as well and we’re so looking forward to seeing him at the Opera House in Sydney very soon! Glad to learn of the release of “Oddities.” Your ’90 collection “Heartbeats Accelerating” was my first CD purchase; you are keeping me technologically on my toes. Conversely, that “The McGarrigle Hour” is now offered on (double! )LP brings balance to my little world. To whom shall we direct our inquiries re. the hinted-at 2011 celebration in NYC? Joe Boyd is visiting Seattle tonight for a reading, shall I ask him? I’ll say hi for you. Years ago we went to a concert from Kate and Ann Mc. Carrigle in “De Doelen” in Rotterdam, I like their music soo much,(in that time I listened nearly every day to their music when I was working in my atelier),I made two etchings and gave them both one: Dancer with bruised knees”, and ,”Bundle of sorrow, bundle of joy”. They both enjoyed making music so much and I see Kate sitting behind the piano so young and happy and I can’t imagine that she died so young. Tonight I go to the concert from Rufus Wrainwright in The Hague and I’m so glad for her that they had so much psychic affinity together! The beginning of the concert was like a recital,it was if he was all alone in himself. The last part of the concert he was so intens and gay and he opened himself for the public. Now I listen to his music and try to remember his beautifull texts, and music,everything is in it! Say goodbye to Ann she’ll miss her sister so much,they did so many things together! I hope to hear many beautifull music more from your family.Thank you very much. It looks like the NYC tribute to Kate is May 11-12 (or is it 10-11?) at the Beacon. It will be announced in the new year.